Put the weaponry away, it’s not the Thunderdome you’re probably thinking of. With a much less brutal nature, Rivalry are releasing a brand new, free-to-play platform that lets Rivalry users compete against each other to prove they are kings amongst men with their esports knowledge and predictions. Not only will this bring supreme bragging rights, but will also bring with it cash prizes if you can correctly predict the match winner outcomes of enough matches in the coming week. Every week Rivalry will add one, if not more, competitions to the Thunderdome, allowing verified users from all across the world to drop in, pick their favourite teams to win from a list of upcoming matches across different esports titles and, if enough of your picks are right, win a share of a Rivalry-supplied prize pool. You may be familiar with this kind of betting process if you’ve placed accumulator bets before, but this has the added security of winning even if you fall short of getting all lines right, plus the benefit of the bet being free! There is currently just the core 3 esports titles covered, with matches spanning across CS:GO, League of Legends and Dota 2. Competitions may be set up around one title, or could span across multiple depending on which tournaments and leagues are in-play, so you may need to branch out of your comfort zone depending on what’s coming up. We can definitely picture title-specific, longer running tournaments focussing on major events, such as Worlds 2019 or The International, as the year progresses. The prize pool for each competition will be shared across the top echelons, splitting the pool across the players that match each layer. Ignoring our poor performance from the screenshot below, you can see an example of how the $175 prize pool has been shared across the 3 users that broke into “the money” tiers. The best part, the remaining money in the pot is rolled over into next week! I live in [insert country], can I play? One of the great benefits of Thunderdome is that it’s region-free; once you’ve verified your account you can participate in their weekly competitions, earn money into your account and withdraw it no matter what country you’re in. Coupled with Rivalry’s existing esports coverage and lovely user experience, we see this as a fantastic extension to their platform. Rivalry also run a VIP Bonus club that lets users win $350+ just by betting and winning on the sportbook, but you’ll have to be in a supported region to access the full functionality. As a licensed gambling company, we have to turn away fans from a lot of regions that really want to bet on esports. We hate saying “sorry man, nothing for you to do here”. Thunderdome is available for anyone in the world as long as they’re 18+. We’re thrilled to be able to have something for the whole world to use and enjoy! Sounds great! Let me at ’em! That’s the spirit! If you think you can predict the way the tides will flow, then we’d definitely recommend getting over to Rivalry and setting up your free account for your chance to win a share of the upcoming weekly prize pools! Their current weekly Thunderdome competition boasts a shared prize pot of $1,000 for anyone lucky enough to predict a clean-sheet of 10 match winners, which isn’t bad for free. Rivalry are an esports-only betting provider registered in the Isle of Man. 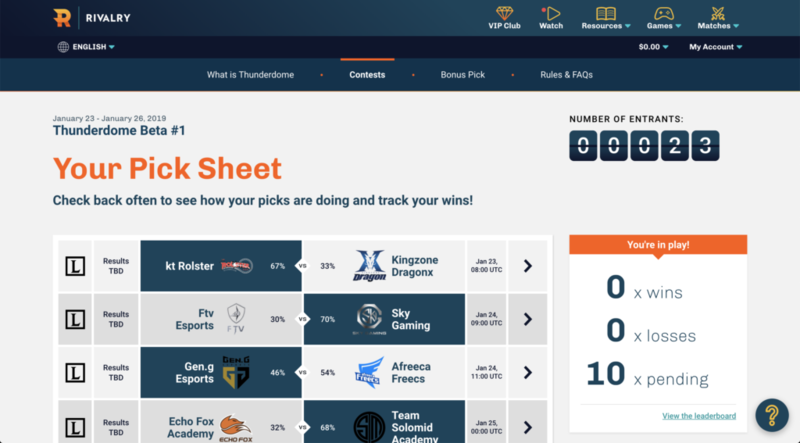 You may have recently seen them across the internet following their sponsorship of esports giants Fnatic, and they have also been a favourite of the SickOdds team with their expert knowledge and unique experiences above and beyond their core sportbook offering. Would you like to know more? Read our full Rivalry.gg esports betting review. 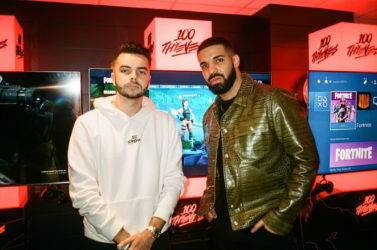 Rapper 'Drake' becomes investor in $3M startup, Players' Lounge.